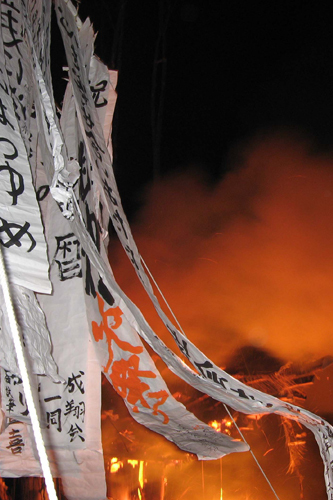 The Nozawa Onsen Fire Festival is a must see if you find yourself in the vicinity mid-January. It`s one of the three most famous fire festivals in Japan & certainly one of the crazier spectacles you`ll ever witness! It`s held on January 15th every year to pray for a plentiful harvest, health and good fortune in the coming year. The festival dates back to 1863 and involves a very colorful combination of snow, fire & sake. We run a bus tour from Hakuba to the Nozawa Fire Festival every year so send us a mail anytime if interested!! During this festival the twenty-five and forty-two year old men from the village play a very important role. An old belief in Japan dictates that, for men, these years are unlucky. So all of Nozawa`s twenty-five and forty-two year old men, in their inauspicious ages, are made to construct a huge wooden shrine known as “the Shaden” that reaches 18 meters high. It takes roughly 100 villagers to build the shrine. The trees are cut down in October and brought down from the mountain, through the village, on January 13th. After the Shaden has been constructed, the priest from Kosuge shrine performs a ceremony endowing it with a God. Along with the Shaden there are an average of five Tôrô (dedicatory lantern poles) erected every year. These poles are made by families in the village to celebrate the birth of their first son. The Tôrô are offered to the Gods in a prayer for health and good fortune. The festivities begin with the lighting of the fire by the twenty-five and forty-two year old men. A small group of men carry a torch, which is lit by striking two stones together, from the Kôno residence to the festival grounds. The torch is used to start a bonfire from which the handmade torches, used to attack the shrine, are lit. The festival centers around the Shaden, where the forty-two year olds sit on top while the twenty-five year olds stand guard at the base. Those who are 41 and 43 years old stand around the perimeter to protect the spectators. Torch bearing villagers of all ages attempt to break through the guards and light the Shaden on fire. A dangerous and lively battle ensues as the free sake makes its rounds of the spectators. Meanwhile, the defenders desperately try to keep the massive wooden float from catching ablaze by striking it with pine branches. The attack lasts for about an hour, after which the 42 year olds call an end to the carnage and the Shaden together with the Tôrô are set on fire in an offering to the Gods. The entire festival can take up to four hours from the beginning to the end, but the main attraction is the battle between the guards and the torch bearing villager……..and the barrels of free sake of course.